Then J.D. Power’s 2014 Vehicle Dependability Study is for you, although the results of this year’s study suggest that 2011 model year vehicles may not be. Original owners of 3-year-old vehicles report more problems during the past 12 months than did the owners of 3-year-old vehicles last year, according to the study, now in its 25th year. The study covers 202 specific problem symptoms grouped into eight major vehicle systems. The results provide some real insight into the dependability of used-car models, especially when compared to previous years’ study results (see links below). Lexus ranks highest in vehicle dependability among all nameplates for a third consecutive year, with a substantial gap over all other brands. Lexus averaged 68 problems per 100 vehicles compared with second-ranked Mercedes-Benz at 104, then Cadillac (107), Acura (109) and Buick (112). General Motors Company received eight segment awards — more than any other automaker in 2014 —for the Buick Lucerne, Cadillac DTS (tie), Cadillac Escalade, Chevrolet Camaro, Chevrolet Volt, GMC Sierra HD, GMC Sierra LD and GMC Yukon. Toyota Motor Corporation earned seven awards for the Lexus ES, Lexus GS, Lexus LS (tie), Lexus RX, Scion xB, Toyota Camry and Toyota Sienna. Honda Motor Company received six model-level awards for the Acura RDX, Honda CR-V, Honda Crosstour, Honda Element, Honda Fit and Honda Ridgeline. MINI received one model-level award for the MINI Cooper. The study grades 32 car brands and models in 21 categories from subcompacts to heavy-duty pickups. The 2014 study, fielded between October and December 2013, was based on responses from more than 41,000 original owners of 2011 model-year vehicles after three years of ownership. 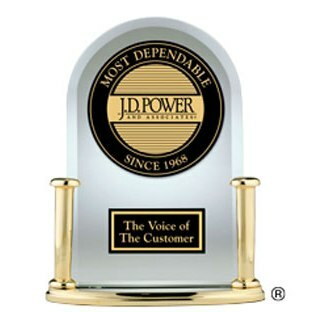 See results from the J.D. Power Dependability Study online, including up to three models per category. And for more information, see the 2013 dependability study covering 2010 vehicles in 18 categories and the 2012 dependability study covering vehicles from model year 2009. If you need fast-and-easy financing to purchase a used or new car, SUV, crossover or pickup, visit RoadLoans.com to get the process started.